We loved our north shore vacation with this as a home base. It had everything we wanted: lake views, fireplace, full kitchen...it was perfect. It was also very secluded, with trees all around so it felt like you were all alone on the lake, which was perfect. I liked the location of the house. I like to be able to go for a walk in the morning or afternoon, and having Cascade Beach Rd available in front of the house was perfect. We've stayed at houses right on highway 61 before which makes it dangerous to walk. The house was a good size for our family. There wasn't anything we didn't have available to us, the house seemed to have everything you might need. It rained one of the nights so having the cozy family room with a tv was great for watching a moving, and the big table in the kitchen was great for playing games. I'm not quite sure the internet was working, but we didn't really need it anyway, as we had spotty phone service in the area. We weren't allowed to adjust the heat, which the cabin did not need. We had the windows open all the time to counteract. Once or twice the water pressure dropped to almost nothing--took a "shower" with a trickle of water. The location/view was amazing- falling asleep to the sound of wolves howling. Watching the resident eagle fly by in the morning. Quiet reflection in the upstairs "reading" area while looking out over lake superior-- priceless. Also priceless?--the sauna--after a long day of hiking to ease sore joints! Birch hollow was great! Comfortable and cute just like a cabin should be. Great WiFi for streaming a movie on a rainy day. Only complaints are: the fan on the gas stove didn't work, some water leaked in the back of the fridge..took us awhile to figure out where the water was coming from, kept wiping up the floor and I would have liked a little more brush cleared from the shoreline. We brought a boat, kayak and paddle board, when the boat was parked in the inlet we had to carry the kayak in. There is a nice small shore to the right that would be great for pulling up kayaks there is just brush in the way. Also, the furniture on the deck that has cushions is pretty gross. We just sat on the ones that didn't have cushions. These are all minor problems, Birch hollow is great! We will be back next year....it's also the only small Cabin on the lake that allows dogs, and it's just my boyfriend and I and a small dog:) Also, loved the easy check in!!! Not having to make a stop at the office for keys, brilliant!!!! We stayed at Castle Rock. There were 12 of us, 5 families, in the house. An extra bathroom, or even a half bath would have been nice but we were able to spread out into our own spaces and yet have a large area where we could all sit and eat or talk. The view was fantastic. We all loved the cabin. We ate most of our meals with family that were within walking distance, the Deer Creek seemed to have all we could possibly need. The directions for accessing the cabin were very good and it was easy to access. The two large family rooms were very comfortable. I was disappointed that I couldn't get down to the beach. It was not made clear to me by staff how difficult the path down was and that there was no hand rail or steps. I had hoped to play on the pebble beachwith my grandchildren. The house was wonderful! It was nice and clean! The kitchen had all the necessities! The bedrooms were comfortable and had extra pillow/blankets, which was super nice in case we forgot anything!! The view from the house is spectacular!! We especially enjoyed the fire pit right on the shore by the water!! One awesome thing was built-in under the staircase a little play house. We had small kids with us and they loved spending time there! Checkung in and out was a breeze! Loved the location on the shores of Lake Superior with such a close proximity to the bike trail. We utilized the kitchenette alot, so that was great! One of my favorite things was that Chateau LeVeaux is pet friendly and had a very nice pet exercise area. The tile in the kitchen, hallway and bathroom was well thought out, easy to clean for tgings like spills,muddy feet, etc. The shower was nice,too. We would definitely come again! The location is good and very roomy. The lot is great with neighbors seeming far away. The lake views are great. Lots of room for a large family and the kids would love the little playroom under the stairs. We did not have children, so we wished our experience was a bit more luxurious. The beds were uncomfortable-very hard with the exception of the one on top floor, though the twins looked better. The bedding smelled sour in the main bedroom. There were only 2 chairs on the glorious deck down below. We didn't bring extra because there was supposed to be more furniture (there were 4 of us). There was a great choice of DVDs and couches were comfortable. Kitchen was great-more than enough supplies. We picked a warm time and most windows don't open or have blinds in bedrooms to keep out the sun. We did have a great time and these details can be easily fixed to provide an excellent experience for the next vacationer. 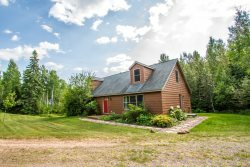 Perfect location in Grand Marais. Small but very comfortable house. We really likes the North Haven because of the privacy and space in the home. Did not realize the air conditioning did not work till we arrived. Also we were hoping for the shoreline to be closer to the home like some of our past places we have stayed. Other than that it was a wonderful place for our family and would stay there again. The location was next door to the resort that family was at so it was great. The views and proximity to the lake were wonderful. It was tight quarters for four of us, but we booked 2 days before arrival so were not expecting anything other than a place to stay that accepted dogs. No complaints. Clean, beautiful, perfect location. Things we've grown used to but missed this time: soap for shower, too little amount of toilet paper. During rain, some water leaks down the fireplace chimney. Home was beautiful and spacious. Loved the home! The deck was outstanding with an excellent view of Lake Superior. The location was great, especially since we visited Isle Royale and Grand Portage State Park. Having to walk to the outhouse or the main house in the middle of the night from the bunkhouse to go to the bathroom was the least thing liked. But overall, a great experience! Would have also enjoyed a more user friendly beach, but still loved the view and location. Really liked the location, the home was spotless, it was close to downtown within walking distance. The shower was not good- no pressure but we made the best of it! Great location and the kitchen wes well stocked with cookware and utensils-everything we needed to make a meal! Would be nice to have some of the bushes trimmed or removed so you can see the lake better! Rental process was seamless, lockbox for initial entry was convenient and condo was beautifully finished. The home was wonderful. The scene was breath taking.